AUD is suffering as a result of disappointing capex data and falling commodity prices early today. Since early February the Australian currency has been amongst the big losers within the G10 universe anyway, as it is suffering as a result of increased risk aversion on the markets. The Australian central bank (RBA) is likely to welcome the depreciation as it favors a rise in inflation towards its target. We nonetheless assume that the central bank will not make the mistake again of sounding too optimistic too early so that the market immediately banks on the start of monetary policy normalization, causing AUD to trade firmer. Instead, the RBA is likely to be interested in the downside correction in AUDUSD continuing for a while. 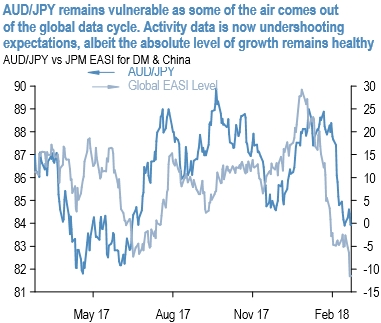 We identified AUDJPY as one of the G10 pairs most vulnerable in the month following a spike in equity volatility, even when the spike is transient and not accompanied by an economic downturn. The performance in the two weeks since we initiated the trade is consistent with this pattern, and we remain comfortable holding the position as global growth expectations are being challenged by less emphatic activity data (refer above chart). Our preference was for a covered put as we believed the options market had priced in an excessive level of tail-risk for the cross, and we note that both the level of vol and the risk-reversal for AUD puts have since abated.